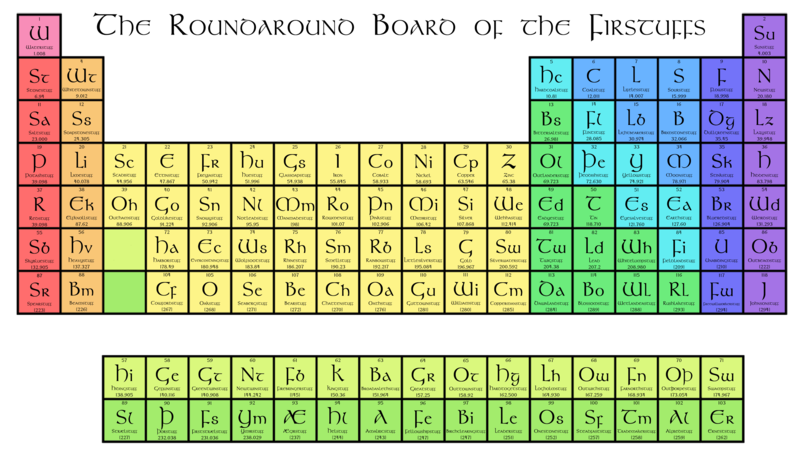 Inspired by Poul Anderson’s essay Uncleftish Beholding – wherein he explains the basics of atomic theory without using any English words of non-Germanic origin – I wanted to make a Periodic Table of the Elements (or, “Roundaround Board of the Firststuffs”, as he calls it) doing the same. I put one together (made with Crayon!) a few years ago, but updated/corrected some names and added the four elements the IUPAC settled on names for last year. Similarly, if you bother to read through the ‘Board’ I’ve made, you’ll see very few elements retain their original names, even with the obvious changing all the –iums, –ines, and –ons to –stuffs. And yet – with all this relabeling – it’s no less scientifically accurate. An element’s name is the least important part of it. Science doesn’t care what we decide to call things. None of the Hydrogen atoms (whose total mass makes up 75% of the baryonic matter in the known Universe) cares we don’t call it Waterstuff, just like Pluto doesn’t care if people don’t want to call it a planet. Previous NASA had a press conference. It’s not aliens.